In WordPress, there is more than one way to set your password. In normal circumstances, you can do it through the WordPress interface. If you forget your password, WordPress has a built in recovery mechanism that uses email. But on some hosts, especially when email isn't working right, sometimes you have to take different steps to reset your password. Here's a list of different ways to reset a password. Any one of them will work, and you only need one to succeed. Which method you will use depends on what type of access you still have to your website. In the Edit User screen, scroll down to the New Password section and type in a new password in the two boxes provided. The strength box will show how good (strong) your password is. If you know your username or the email account in your profile, you can use the "lost password" feature of WordPress. Note if you have a recent version of MySQL (version 5.x?) you can have MySQL compute the MD5 hash for you. Note that even if the passwords are salted, meaning they look like $P$BLDJMdyBwegaCLE0GeDiGtC/mqXLzB0, you can still replace the password with an MD5 hash, and WordPress will let you log in. 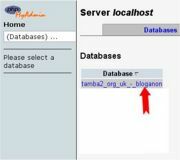 Begin by logging into phpMyAdmin and clicking databases. A list of databases will appear. Click your WordPress database. Look for wp_users in the Table column. Next to the user_pass is a long list of numbers and letters. Select and delete these and type in your new password. Type in the password you want to use. Just type it in normally, but remember, it is case-sensitive. Once you have done that, click the dropdown menu indicated, and select MD5 from the menu.